This document describes the details of the commands and data structures that make up the Containers system. The Containers Guide provides useful context about the workflows and goals of the system that inform these technical details. This section describes the command line interface to the Containers system. It will create a new experiment in MyProject called MyExperiment containing the experiment topology in mytopology.tcl. All the topology creation commands supported by DETERLab are supported by the Containers system, but DETERLab program agents are not. DETERLab start commands are supported. Containers will create an experiment in a group if the project parameter is of the form project/group. To start an experiment in the testing group of the DETER project, the first parameter is specified as DETER/testing. Containers supports ns2 file or topdl descriptions. Ns2 descriptions must end with .tcl or .ns. Other files are assumed to be topdl descriptions. Names of substrates and nodes in ns2 files are restricted to valid tcl variable names. Names of substrates and nodes in topdl files are restricted to the characters A-Z, a-z, digits, the underscore and the hyphen (-). By default, containerize.py program will partition the topology into openvz containers, packing 10 containers per physical computer. If the topology is already partitioned - meaning at least one element has a containers::partition attribute - containerize.py will not partition it. The --force-partition flag causes containerize.py to partition the experiment regardless of the presence of containers:partition attributes. Containerize nodes without a container type into kind. If no nodes have been assigned containers, this puts all them into kind containers. Attempt to put int containers into each physical node. The default --packing is 10. Attempt to divide the experiment into int physical nodes. The default is to use packing. There are some nuances to this with mixed containers. See the Containers Guide for more details. Read configuration variables from filename. Configuration values are discussed below. Override the site configuration and request nodes of type1 (or type2 etc.) as host nodes. Attempt to do end node traffic shaping even in containers connected by VDE switches. This works with qemu nodes. Topologies that include both openvz nodes and qemu nodes that shape traffic should use this. See the discussion below. Do traffic shaping in VDE switches. Probably the default, but that is controlled in the site configuration. See the discussion below. Set the default openvz disk space size. The suffixes G and M stand for 'gigabytes' and 'megabytes'. Set the default openvz template. Templates are described in the Containers Guide. Add a directory to be searched for openvz templates. Templates must end in tar.gz and be accessible to the user at creation and swap time. They can only be located under the /proj or /share directories. Construct a visualization of the virtual topology and leave it in the experiment directories (default). Ignore network constraints when partitioning nodes. Do not construct a visualization of the virtual topology. Specify the packing factor for each partitioning pass. The [ContainersGuide#MoreSophisticatedPacking:MultiplePasses Containers Guide] describes this in detail. Specify the number of physical machines to use for each partitioning pass. The Containers Guide describes this in detail. Specify the pnode types on which nodes packed in partitioning pass pass can be placed. The Containers Guide describes this in detail. Specify the partitioning passes on which network connectivity is ignored. The Containers Guide describes this in detail. Make sure that Qemu images mount the given users' home directories. Qemu nodes can mount at most 19 users' home directories and this ensures that the experimenters using the containers can reach their home directories. Print additional diagnostics and leave failed DETER experiments on the testbed. Do not remove temporary files - used for debugging only. takes the topology in ~/experiment.xml (which must be a topdl description), packs it into 25 qemu containers per physical node, and creates an experiment called 'DeterTest/faber-packem' that can be swapped-in. If experiment.xml is already partitioned, it will be re-partitioned. If some nodes in that topology are assigned to openvz nodes already, those nodes will be still be in openvz containers. The result of a successful containerize.py run is a DETERLab experiment that can be swapped in. More detailed examples are available in the Containers Guide. The container_image.py command draws a picture of the topology of an experiment. This is helpful in keeping track of how virtual nodes are connected. containerize.py calls this internally and stores the output in the per-experiment directory (unless --no-image is used). A researcher may call container_image.py directly to generate an image later or to generate one with the partitioning drawn. The first parameter is a topdl description, for example the one in the per-experiment directory. The second parameter is the output file for the image. When drawing an experiment that has been containerized, the --experiment option is very useful. Draw the experiment in project/experiment, if it exists. Note that this is just the DETERLab experiment and project names. Omit any sub-group. Draw the topology in the filename indicated. Prefix for containers attributes. Deprecated. Draw labeled boxes around nodes that share a physical node. Save the image in the filename indicated. --program=programname Use programname to lay out the graph. programname must take a file in graphviz's dot language. This is given as the --program option to fedd_image.py internally. The default is fdp which works well when --partitions is given. If neither --topo nor --experiment is given, the first positional parameter is the topdl topology to draw. If --out is not given the next positional parameter (the first if neither --topo nor --experiment is given) is the output file. Several topdl attributes influence how an experiment is containerized. These can be added to nodes using the ns2 tb-add-node-attribute command (used throughout the Containers Guide) or directly to the topdl. The container that will hold this node. The full list is available here. An identifier grouping nodes together in containers that will share a physical node. Generally assigned by containerize.py, but researchers can also directly assign them. The containerize.py command assigns integers, so if a researcher assigns other partition identifiers, containerize.py will not overwrite them. The flavor of Linux distribution to emulate on openvz. There is a list of valid choices in the Containers Guide. Amount of disk space to allocate to an openvz container. Be sure to include the G (gigabyte) or M (megabyte) suffix or the size will be taken as disk blocks. If this attribute is true, resources will be allocated for this node, but it will not be started when the topology is created. A location to download the QEMU image for this container. The name is a legacy that will disappear. This is deprecated. There are a few other attributes that are meaningful to more applications. Users specifying ns2 files will not need to set these directly, as the DETERLab ns2 interpreter does so. The start command. tb-set-node-startcmd sets this. The IPv4 address of this interface. Set by the ns2 commands for fixing addresses. The IPv4 netmask. ns2 sets this. These files control the operation of the containers system. When an experiment is containerized, the data necessary to create it is stored in /proj/project/exp/experiment/containers. The path /proj/project/exp/experiment is created by DETERLab when the experiment is created, and used by experimenters for a variety of things. This directory is replicated on nodes under /var/containers/config. If the topology was passed to containerize.py as an ns file, this is a copy of that input file. Useful for seeing what the experimenter asked for, or as a basis for new experiments. The analog of experiment.tcl, this is the topology given as topdl. The topdl input file. The host to IP mapping that will be installed on each node as /etc/hosts. site.conf A clone of the site configuration file that holds the global variables that the container creation will use. Values overridden on the command line invocation of containerize.py will be present in this file. First version of the input topology after default container types have been added. Input to the partitioning step. A yaml representation of the partition to virtual node mapping. The server and channel to use for grandstand communication. Encoded in YAML. Directory containing the assignment, including all the levels of nested hypervisors. The contents of the per-experiment directory (except config.tgz) for distribution into the experiment. Containers that are initially not started in the experiment. Yaml encoding of the qemu images to be used on each node. Yaml encoding of the openvz templates to be used on each node. Output of the partitioning process. A copy of annotated.xml that has been decorated with the partitions. The ns2 file used to create the DETERLab experiment. The topdl file used to generate phystopo.ns. The DETERLab project and experiment name under which this topology will be created. Broken out into /var/containers/pid and /var/containers/eid on virtual nodes inside the topology. A directory containing the routing tables for each node. Yaml-encoded data about the per-network and per-node loss, delay, and capacity parameters. A directory containing the VDE switch topology for the experiment. Yaml-encoded extra switch configuration information. Mostly VDE switch configuration esoterica. The final topology representation from which the physical topology is extracted. Includes the virtual topology as well. This file can be used as input to container_image.py. Pickled information for configuring endnode traffic shaping. Specific parameters for configuring the delay elements in VDE switched topologies that implement traffic shaping. See below. The site configuration file controls how all experiments are containerized across DETERLab. The contents are primarily of interest to developers, but researchers may occasionally find the need to specify their own. The --config parameter to containerize.py does that. The site configuration file is an attribute-value pair file parsed by a python ConfigParser that sets overall container parameters. Many of these have legacy internal names. The default site configuration is in /share/containers/site.conf on users.deterlab.net. The directory that stores openvz template files. Default: %(exec_root)s/images/ (that is the images directory in the exec_root directory defined in the site config file. This can be a comma-separated list that will be searched in order, after any template directories given on the command line. The program used to convert ns2 descriptions to topdl. The default is fedd_ns2topdl.py --file but any program that takes a single ns2 file as a parameter and prints the topdl to standard output is viable. On DETERLab installations /usr/testbed/lib/ns2ir/parse.tcl -t -x 3 -m dummy dummy dummy dummy can be used to decouple containers from needing a running fedd. The network on which testbed infrastructure lives that needs to be routed through default_router. Different container types have some quirks. This section lists limitations of each container, as well as issues in interconnecting them. Qemu nodes are limited to 7 experimental interfaces. They currently run only Ubuntu 12.04 32 bit operating systems. Physical nodes can be incorporated into experiments, but should only use modern versions of Ubuntu, to allow the Containers system to run their start commands correctly and to initialize their routing tables. The various containers are interconnected using either local kernel virtual networking or VDE switches. Kernel networking is lower overhead because it does not require process context switching, but VDE switches are a more general solution. Network behavior changes such as loss, delay or rate limits are introduced into a network of containers using one of two mechanisms: inserting elements into a VDE switch topology or end node traffic shaping. Inserting elements into the VDE switch topology allows the system to modify the behavior for all packets passing through it. Generally this means all packets to or from a host, as the Containers system inserts these elements in the path between the node and the switch. 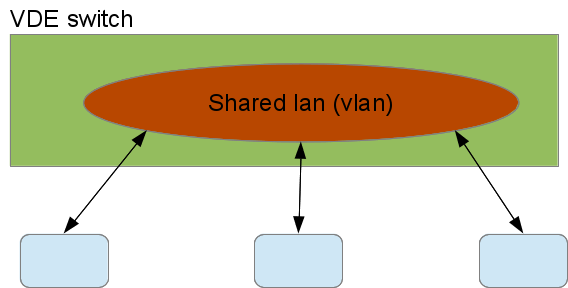 The VDE switch connects the containers with shaped traffic to the delay elements, not to the shared VLAN. The delay elements are on the VLAN and delay all traffic passing through them. The Container system configures the delay elements to delay traffic symmetrically - traffic from the LAN and traffic from the container are both delayed. The VDE tools can be configured asymmetrically as well. This is a very flexible way to interconnect containers. That flexibility incurs a cost in overhead. Each delay element and the VDE switch is a process, do traffic passing from one delayed nodes to the other experiences 7 context switches: container -> switch, switch -> delay, delay -> switch, switch -> delay, delay -> switch, and switch -> container. The alternative mechanism is to do the traffic shaping inside the nodes, using Linux traffic shaping. In this case, traffic outbound from a container is delayed in the container for the full transit time to the next hop. The next node does the same. End-node shaping all happens in the kernel so it is relatively inexpensive at run time. Qemu nodes can make use of either end-node shaping or VDE shaping, and use VDE shaping by default. The --end-node-shaping and --vde-switch-shaping options to containerize.py force the choice in qemu. 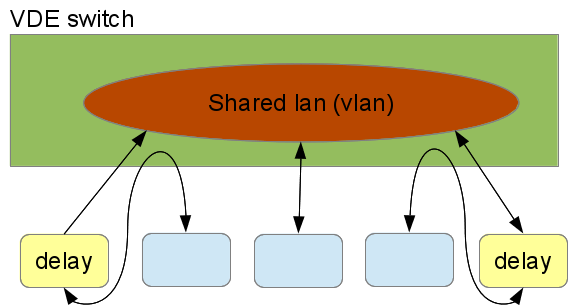 Openvz nodes only use end-node traffic shaping. They have no native VDE support so interconnecting openvz containers to VDE switches would include both extra kernel crossings and extra context switches. Because a primary attraction of VDE switches is their efficiency, the Containers system does not implement VDE interconnections to openvz. Similarly embedded physical nodes use only endnode traffic shaping, as routing outgoing traffic through a virtual switch infrastructure that just connects to its physical interfaces is at best confusing. Unfortunately, endnode traffic shaping and VDE shaping are incompatible. Because endnode shaping does not impose delays on arriving traffic, it cannot delay traffic from a VDE delayed node correctly. This is primarily of academic interest, unless a researcher wants to impose traffic shaping between containers using incompatible traffic shaping. There needs to be an unshaped link between the two kinds of traffic shaping. For qemu images to boot reliably, they should not wait for a keypress at the grub command, which is distressingly common. Just make sure the HIDDENs are not commented out and have true/0 values. The Containers system adds all users to the admin group so that group should be able to use sudo without providing a password. Copyright © 2018 DETER Project.